The deep frost is almost gone and we are only 15 days away from, once again, worshipping at the Cathedral of Football. It's been an eventful week here in RBNY Land, so let's get to some news. The week started off with a bang, as the Red Bulls dismissed long time coaching staff members Richie Williams and Des McAleenan. This was a shocker that came totally out of nowhere. An explanation has yet to be given by the parties involved or the local media (who have hinted that an explanation has been given as to why Williams and McAleenan were dismissed). There was even this post from Metrofanatic Dan, where he refers to the offense as being "non-soccer related" and "not a power" play by Soler/Backe, as was surmised by Ives Galarcep. So, we'll keep waiting for the official explanation, but let's not hold our breath. The countdown to the 2011 season kick-off is officially on and the team is down in Arizona on the last leg of their pre-season. There, they'll take on local side FC Tucson, and MLS' Sporting KC, in something known as The Desert Cup. With several players injured and starting spots up for grab, several roster questions will need an answer, and quickly. One of those questions, regarding the starting Center Backs, has been answered for several weeks. Mr. Backe will partner Rafa Maquez at Center Back, with Tim Ream. Earlier this week, Rafa stated that he welcomed the change and that Center Back is where he feels the most comfortable. One thing is for sure: the former Barca man must shine this season if RBNY intend to have any chance of winning it all. Red Bulls midfielder Mehdi Ballouchy is facing the prospect of missing the team's away games in Canada because of his green card situation. You might recall that Ballouchy was not able to join RBNY on the Mexican leg of the pre-season because of this problem. This past weekend, while in Florida, Thierry Henry, Roy Miller and Juan Agudelo made an appearance on Univision's Republica Deportiva show. Henry teased Agudelo on his choice of USMNT over Colombian NT and Fernando Fiore also got into the act by giving TH14 grief over his ball-handling skills. He'll never live that one down. The Red Bulls announced the start of the RBNY Membership program. The chief benefit of this programs is the "Members Only" concession lines that will be "designed to provide Members with shorter concession lines and faster service". Full season "RBNY Memberships" are free to all season ticket holders. If you aren't one, then what are you waiting for? The Garden State Supporters will hold their 1st Annual GSS Art Show/Auction tommorrow, Saturday March 5th at MMM Bello's. Proceeds will go towards GSS operations and future projects. Newly retired Red Bulls Midfielder Seth Stammler is now fully focused on the charitable work done by his Sporting Chance Foundation. Whatever happened to former MetroStars midfielder Jim Rooney? Well, click here to find out. 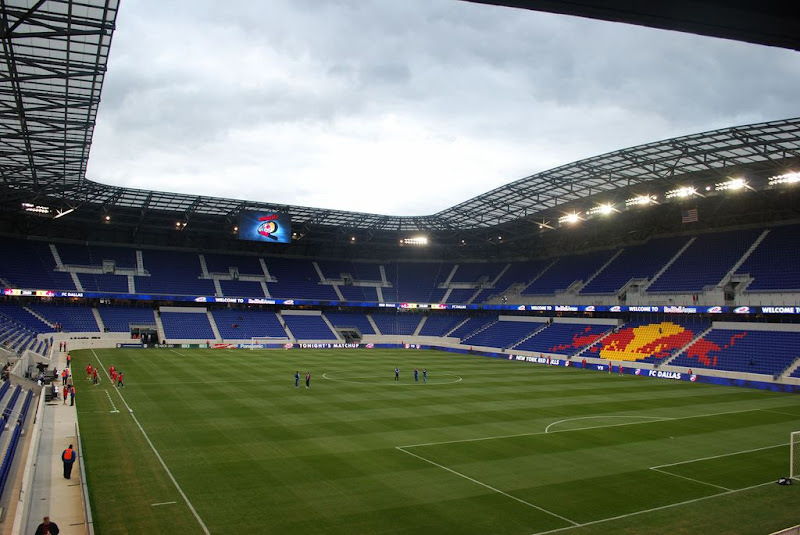 As you might very well know, the 2011 MLS All-Star game will be held at Red Bull Arena on Wednesday, July 27th. MLS announced the date and location but did not announce an opponent. Well, according to this article, the opponent will be none other English powerhouse Manchester United. Recently waived Red Bulls midfielder Sinisa Ubiparipovic has surfaced in MLS, playing a pre-season match for Sporting KC.